Looking for a revolver for concealed carry? 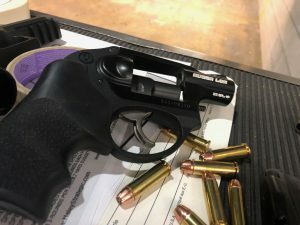 Maybe the LCR (Lightweight Compact Revolver) from Ruger is the answer? Ruger LCR Review in 38 Special. The popularity and advantages of semi-automatics have made using a revolver for everyday carry (EDC) more of a rarity. But there are still some positives to the old revolver, and they are far from disappearing altogether. Ruger's line of lightweight compact revolvers (LCR) began 2009 with the .38 Special version. Due to success, the company produced LCR's for 357 Magnum, .22 LR, .22 WMR, 9mm, and finally in 2015, .327 Federal Magnum. I've owned my LCR .38 Special for over 4 years now, and while I don't use it as my primary EDC gun, it routinely comes out to the range with me. Why? Not only do I pocket carry the gun from time to time, but it is also fun to shoot. With over 4 years of use, I thought it would make sense to give you a Ruger LCR Review and explain why this trusty wheel gun is still one of my favorites. At only 13.5 ounces it weighs about as much as a can of soda, which is nice if you're going to pocket carry this gun. Ruger accomplished this by doing a number of things. For the LCR's chambered in .22 LR, .22 WMR, and .38 Special the ‘monolithic frame' is made of aerospace 7000 aluminum. When chambered for .357 Magnum, 9mm, and .327 Federal Magnum it is made of 400 stainless steel. I'm not going to claim to know the tolerances of various grades of aluminum and steel, but let's say that the LCR frame is lightweight and incredibly strong. The fire control housing, which essentially comprises of the grip and trigger guard areas, is made of polymer. Using these materials has made the LCR lightweight, yet durable. Ruger also spent a considerable amount of time, and cost, ‘fluting' or removing any unnecessary material around each chamber. This also is a factor in making the gun lighter. This grip from Hogue helps reduce the unpleasant recoil that comes along with a lightweight, snub nose revolver. Of course, the downside to very light guns, especially revolvers, is greater felt recoil. Ruger addressed this well by adding a rubber, Hogue ‘Tamer Monogrip' that makes the gun easier to grip and control. Also, the area high on the back strap, where the webbing of your hand would meet, has an added rubber insert that helps lessen the felt recoil. Those who are more sensitive to recoil will definitely benefit from this grip, as well as those who shoot more than a few rounds when at the range. While the rubbery grip is great for your hands, it takes some time to learn how to draw from the pocket because it has a tackiness that clings to the material inside the pocket. The gun is tiny. It's barrel length is just 1.87 inches with an overall length of 6.5 inches. It's a slim revolver as well with that nicely trimmed 5-shot cylinder measuring only 1.2 inches at its thickest point. Between its light weight and small size, I find myself tossing it into my pocket when I am out on my property cutting grass or walking the dog, especially if I am not wearing a shirt. The LCRs without an X associated are all double-action. The LCR-X's have an exposed hammer making it DA/SA. Ruger spent a lot of time on improving on the traditionally long, heavy and unpleasant double-action trigger pull usually associated with revolvers by engineering a ‘friction reducing cam' inside the trigger group. Have ever squeezed a trigger and found that it seems like the amount of pressure needed increases as the trigger moves to the rear? This is called trigger ‘stacking' and makes the trigger feel inconsistent throughout the trigger pull. The friction reducing cam was designed to eliminate stacking, and I feel they got it right. Ruger says the trigger pull weight should be around 7 lbs 8 ounces. I would put it closer to 10-11 pounds, as it maxed out my 8 lb trigger pull gauge and had quite a bit more to go. The factory sights leave a lot to be desired. Luckily the front sight is removable and there are a few companies that make a variety of replacement sights. I feel that the LCR's double-action trigger is really predictable and smooth. It is important to note that the trigger must return fully forward to reset. This can cause some issues for shooters who are used to shooting a Semi-Auto with a trigger that has a short reset point. To add to the confusion, there is a noticeable ‘click' before the trigger is fully let out and reset. This is not a malfunction and is part of the gun's proper operation. Take some time learning your trigger, and you will be good to go. The factory sights are underwhelming, with a solid black, front sight ramp and just a notch or ‘gutter' rear sight. However, Ruger made it so the front sight can be easily replaced by removing a single roll pin. This way, you can replace the front sight with something a little more eye-catching and practical. The cylinder latch is a button, which I find intuitive as it somewhat mimics a magazine release on a semi-auto. The ejector rod is shrouded and operates smoothly. I really like the finish on the gun. The all black aluminum has been tested by Ruger to withstand all types of corrosion and although my LCR gets tossed around, it doesn't show any worse for wear. The cylinder is not shiny stainless steel, rather it has been treated to a black color, which is much preferred in my opinion. I have seen some other editions with different finishes on the cylinder as well. The trigger is the only part of the gun that seems to have untreated metal exposed. With the exception of the stock sights, the LCR is a perfect option if you want a revolver for concealed carry. Not only is it rated for +P ammunition, but it also has a shrouded hammer, sights and controls that won't snag, lightweight and small design, and a smooth and consistent double action trigger pull. Over the 3 plus years I have owned the gun, I would guess that I have fired around 3000 rounds. They have been a mixed bag, mainly 125 /158 grain FMJ and 158 grain +P HP ammunition. I have not experienced any mechanical problems. I have definitely short stroked that long trigger more than I would like to, but mechanically speaking the gun is sound. Not only that, but the gun is surprisingly accurate. Don't assume that a revolver with poor, fixed sights, a 1.87″ barrel and a 10+ pound, double-action trigger would be too challenging to obtain reasonable groups at distance. I am not a world-class shooter by any means, but at 25 yards the grouping, while high, is decent. The prices vary slightly by the caliber of course, and you can pick up the 38 special models for a little under $500. That makes the LCR a bit more pricey than the similar M&P Bodyguard but less expensive than a S&W 642 or similar. These guys have them in stock for under $420, as of this writing. 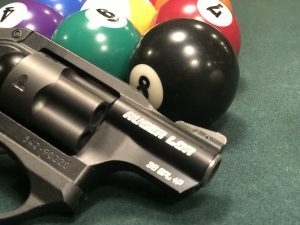 All in all, this little pocket, wheel gun can hold its own and is definitely a viable option for someone wanting a reliable concealed carry revolver. Leave your comments on our Ruger LCR Review, below. After 27 years in federal law enforcement, I went to back my first carry weapon, a wheel gun. I now carry a SW 642. I found this gun just right after carrying Sig Sauer ‘s for 20 +. 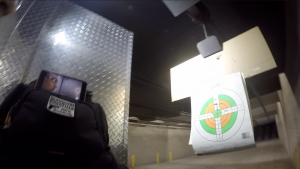 I always have 5 extra rounds with me…..I need to do more reload drills thought…. i’d like to know more. how do we qualify to do this? I have the exact same revolver going on 5 years now. Very reliable and easy to carry. I carry it anytime I am outside my property loaded for bear or snake shot. We have both. Quick grab with my pocket holster which is how it is stored. Never had any problems. I did have an LCR but did not care for the trigger. I now have a S&W Airweight with a lasar sight and it shoots better. I also sometimes appendix carry a Sig P938. A great revolver, I purchased 5 of them so far. Gave some of the out as Christmas presents. While I sold the 38 to a friend who needed a bedside piece, I carry the 357 often stoked with the old 158gn lead swc. A speed loader for a 5 shot is small in size as well for the short trips to the grocery store. I carry mine in an appendix holster from crossbreed and also a galco ankle rig for a back up or deep concealment. Just recently purchased the 8 shot 22lr and it’s a blast! Pun intended! I have had an LCR for 10+ years. While I prefer my M&P Shield. The LCR is very useful especially in the summer when I am wearing shorts and a t-shirt. I purchased a LCR-357mag about 5yrs ago. Great little revolver, especially the trigger. One range visit it froze up when shooting a cylinder full of Corbon 125gr 357 mag. Because of the recoil, apparently one shell “backed out “ locking the cylinder up. Took a while to free it , and continued to shot a couple more cylinders full. Finally , not wanting that to happen again, traded it in in a SP-101 2.25in DAO 357mag, and never looked back. Much less recoil, superb accuracy , and easy to conceal, IWB or OWB. I absolutely LOVE revolvers! The problem is their cost! In 1997, I had 2 .38’s one S&W and one Taurus. I had 2 .357’s one S&W and one Taurus and a Ruger .44 mag. I was proficient with them all. I came home from work and, it never failed, for some reason I would check my gun safes. This one day my hand gun safe was moved but NOBODY admitted to it! This is when school shootings were becoming “popular”, if you will. I sold all of my hand guns! When Obama came for the guns, I looked into buying a revolver. I figured if guns were gone, only law enforcement and criminals would have them and I wanted to protect my family my way. The priced of revolvers gave me “sticker shock”!! I paid no more than $250.00 for any of the 5 hand guns I mentioned! lol So, I bought my first semi-auto. It was nice but I just didn’t like it. Give me a revolver any day!